French company PIQ is no stranger to sports tracking. It's already built wearables to take out on the golf course, the tennis court and even the slopes to give you that extra hit of data. Now it's turning its attention to boxing with the help of iconic sports brand Everlast for the PIQ Robot. 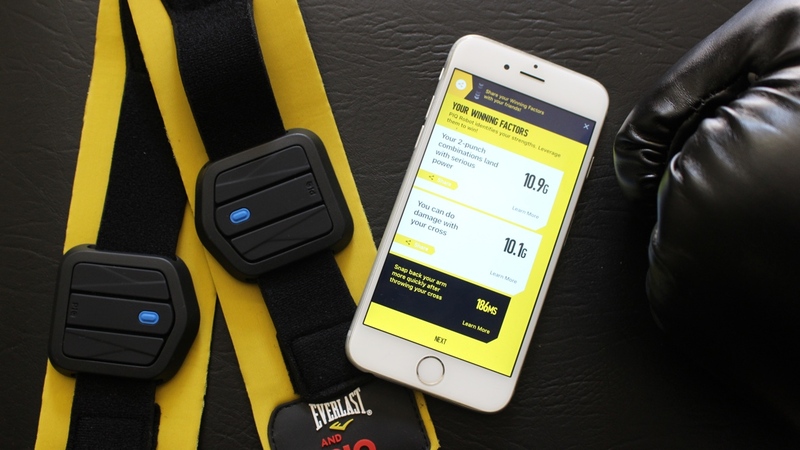 The sensor, which costs $99 for one or $199 for two to track both fists, is designed for core boxing and fitness boxing but should also appeal to MMA fans. It'll let you track shadow boxing, heavy bag sessions, mitt work and sparring. In terms of the data you can pore over the key punch metrics of punch speed, G-force at impact and retraction time. The killer feature though is the AI tech on board that analyses workouts to help pinpoint strengths and weaknesses lies and offer advice on how to make improvements. After giving the Hykso boxing sensors a try recently, we decided to put the PIQ Robot boxing to the test to see if the boxing wearable is a good fit for getting your punch on. So we've already mentioned that you can buy the PIQ Robot just for one hand, but if you really want to get the most out of it, you should probably invest in two. We got our hands on a pair and in each box you'll find the sensor, which measures in at 44mm x 38mm and weighs just 9.8g. This is essentially the very same sensor that PIQ uses for all of its other sports tracking with the added software algorithm tweaks to make it more boxing-friendly. Having just used the Hykso trackers, the Robot trackers are significantly bigger finding room for just a single button to turn the sensors on. Alongside the sensor is a small charging cradle to power up the device, which delivers up to 8 hours of battery life off a single charge. To get those sensors on your wrist, you have multiple wearing options. The first is with the supplied hand wrap where the Robot sits inside of a case and a velcro strap keeps it secure around the wrist. Now this isn't your standard type of boxing hand wrap. It's actually much shorter, just enough to get the sensor in place around your wrist. You really need to make sure that loop sitting over the thumb is nice and snug otherwise it's going to move about and prove a nuisance when you start boxing. Thankfully, you do have two more options if you don't want to use the wraps. The first is to place the sensor inside the gloves in the gap between where the velcro secures the glove on your hand. While it does remain secure and in place, you'll need someone to give you hand to do it as it's very fiddly. The second perhaps more favourable option is to simply slip it into your own hand wraps before pulling on your gloves. As far as comfort, you do notice them more than you do the Hykso trackers simply because of the size difference. Apart from some slight discomfort on the right wrap during one session though, it's generally all good on the comfort side. We just wish they were a little smaller. Getting ready to track first requires downloading the Everlast and PIQ companion smartphone app, which is available for both iOS and Android. It's all pretty standard fare although we weren't the biggest fans of having to hand over our phone number simply to get the sign up process up and running. Once your profile details are all good, including selecting your boxing stance and strongest hand, it's time to pair the sensors to the app. To do that you need to look for the small icon in the top right hand corner of the app. As this was our first time setting up we had to negotiate our way through multiple software updates before we could choose from automatically or manually pairing the sensors to the app. The good news is that we didn't have any Bluetooth pairing issues trying out on an iPhone or an Android phone. As long both sensors are charged, it's time to get boxing. Once you start boxing the sensors will start tracking. There's no modes to select, it just tracks as you soon start punching. We've already mentioned the array of data and punch metrics that the Robot promises to deliver and while it does do this all in real-time, there is one very big problem. You can't view any of the data in real-time on your phone. So there's no way to really see if the punch counts are accurate. In other words, you are putting a lot of faith in the sensors that they are doing their job properly. As we found in one session, one of the sensors clearly wasn't in the correct position so didn't register all of our shots and skewed the data. Once you've exhausted yourself and you can punch no more, you need to head back to the pairing section in the app and then you should see a prompt to sync the recorded data. It can take a minute or so depending on how long you boxed for, but it's generally pretty quick at crunching those numbers. What you then get is a breakdown of your workout. First is the Winning Factors, which picks out your strengths. In one session it told us that it was a very high intensity session and in another highlighted the effectiveness of our 2-punch combos. This can of course all be shared to the likes of Facebook, Twitter or Instagram if you feel the need to gloat about your performance. The app will also give you an area where you can seek to make improvements as well. Each of these factors can be drilled in closer, plotting the data on graphs and offering tips on how to improve aspects like keeping up the consistency of your punches. The next screen breaks down data including workout time, total punches and highlights your best PIQ score, punch speed and punch G-Force. The punch count figures roughly match up to what we managed for similar length sessions with the Hykso trackers, but there's no definitive way to know that it was on the money. Other bits of data worth highlighting are the record of total punches, calories burned and time spent boxing you can see from the app dashboard. There's also the PIQ score graphic and the ability to look back at sessions in the calendar view mode. The PIQ Robot on the whole is a pretty impressive boxing wearable. It's easy to set up and we really appreciated the versatility in terms of getting those sensors around the wrist. The post-workout analysis provides some really unique insights and the breakdown of data means there's the option to dig deeper if you really want to. We just wish that some of those great punch metrics were available to view during a workout. Granted, not everyone will be working out with their phone nearby, but it's also useful to know whether those sensors are properly in place and accurately picking up the data. So how does it compare to the competition? We're of course talking about Hykso's punch trackers. The rival wearable, which costs $190, can't match the PIQ Robot's AI powers but it does get a lot of other things very right. They're smaller to wear for starters making them a lot less troublesome to get them on in the first place. The Hykso also offers charging from one cradle as opposed to the two you need to keep hold of with PIQ and Everlast's setup. It's a small thing but it does make a difference. Crucially, you can watch your data in real-time on your phone or tablet, so if you're not wearing them properly, you'll know straight away. We also appreciate the ability to replicate a boxing match scenario and the more simplified app is a little nicer to get around. If we had to pick one right now, we'd be inclined to say there's more going for Hykso right now. If PIQ can shrink its sensors down more and offer the ability to actually view data in real-time to go with its great AI party piece, then it could one day be king of the boxing wearable ring.